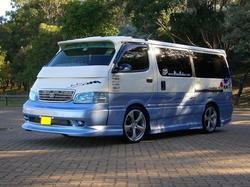 Here is another link to the Hiace manual. May I have a copy of 3L manual please. I would much appreciate a copy of the manual. Can you send me one please. Any costs. Model and year : HiAce DX, 2.8D (3L), Selective 4wd, Auto, 1995, Am' Craft Camper. Hey guys, I found someone selling this on ebay. It might be the same one that MaxiLeeCH is sharing, but when I opened the link it seemed very sketchy. Has anybody already downloaded it from that link that he posted? Would like to have the 2.8 diesel 3l engine manual( i only seen the turbo version on links above). Email at bordurat at hotmail dot com. thank you very much. Has anyone still got this 1989-2004 RZH100 manual? I need some torque values for my brake reassembly. Do you know which engine you have? It will be on a plate next to the engine access. Can you describe the actual problem? where is engine accecc plate? So that is the 3L engine, in probably a LH119 chassis. The plate he means is next to the engine, when you open the "bonnet". When standing at the left front wheel, it should be above the wheel (when bonnet is lifted). But I don't think it is needed anymore. it look like scam it shows video not related What is this? Would be great if you could send a copy of 3L manual to brian@facts4.me.uk thanks in anticiapation. Hi, i could do with a workshop manual for the 2.8 diesel engine 3l non turbo toyota hiace. Please! I would like a copy of the manual for the 3l diesel, please.